Last we left these folks, Denise was busy getting her arm torn into by a zombified Holly, and as my man Ron Burgundy would say "Well...THAT escalated quickly." Rick wastes no time acting on this tragedy, he puts a bullet in Holly's head and calls out for something sharp. A hatchet, a knife, ANYTHING! He needs to cut off her arm before the infection gets in too far. Then, even if they amputate it'll be useless. Heath, Denise's boyfriend runs over to help. When an explosion goes off right behind him tearing off one of his legs! Negan's began throwing grenades over the wall into the town! Chaos ensues EVERYWHERE. Bombs are going off near houses lighting them up on fire, forcing the people inside to escape. Luckily, the people of Rick's town are quick thinkers. Jesus actually catches a grenade and tosses it back over the wall taking out some of Negan's men with it! This almost takes out Gregory, Rick's inside man hidden in Negan's ranks. He survives long enough to kill some of the other survivors of the reverse grenade, yelling over to Jesus to make sure rick knows what he's doing. He wants to be trusted. I don't buy it, but we'll just have to wait and see we're that goes. The next page is Negan saying some seriously sexual things to Lucille, his barbed wired bat. One of his jokes is actually pretty funny, but the jokes are cut short when the bullets fly into his men's heads. Nowhere is safe, even if you've got more men! Someone is forcing Negan and his men to retreat into their trucks and high tail it back to their camp. On the next page we see it's Maggie! Yay Maggie! Now that everything is calm, Rick is able to take Carl to Denise, who's still working on Heath, to rest up. Heath is going to live, but how long will Denise? 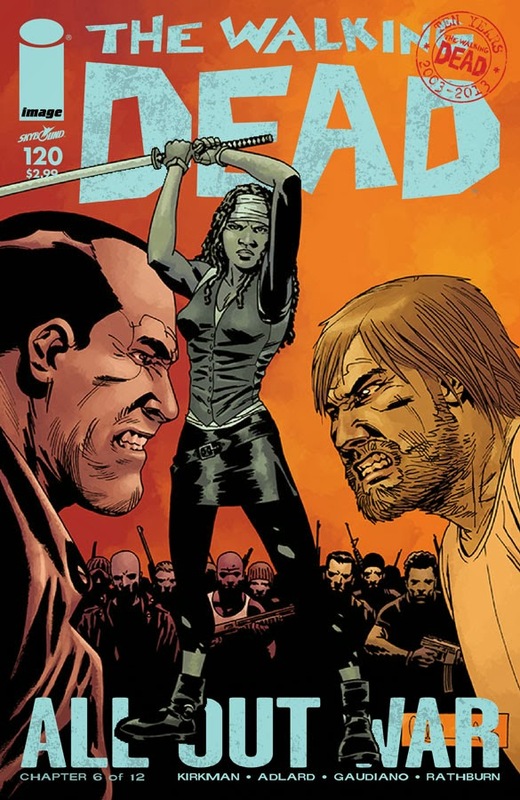 Maggie finally confronts Rick, telling him she didn't feel safe on the Hilltop, and is the new leader. Rick's numbers are growing more and more no matter how many men or tigers they've been losing. But of course, that doesn't las long, as he faints right in front of Andrea and Maggie. Over yonder where Negan has ended up, he thinks he's won. He's burned their city to the ground. No firefighters coming, no one to help them. The tables have turned yet again but this time to the side no one wants it to be on. This issue was much better than the last couple issues. Paced much quicker, and it didn't let up at all. Not too much happened, but it wasn't a drag to read. Definitely had a good time with this one, be back in two weeks for the first chapter of the second half of All Out War!